How do I get my child to listen to me at home? This is a common question I hear from parents. One solution is by using the basic principles of reinforcement and punishment. These principles will allow parents to gain control over their child’s behavior, and they will begin to see a decrease in negative behaviors and an increase in positive behaviors at home. When you want to see a desired behavior increase or continue to occur, you should use reinforcement. It is important to first identify what is reinforcing to your child. Some children are very reinforced by adult attention, whereas other children are motivated by being alone playing electronics. It is also important to have variety of reinforcers that are used. If you are reinforcing your child with the same item over and over again, they are likely to get bored with that item. Of course you don’t want to give your child access to the iPad every time they engage in a desired behavior, so you need to mix and vary the type of reinforcement used. Reinforcement can range from simple praise for taking out the garbage to buying highly desired toy for getting all A’s on the latest report card. Decide which behaviors you currently are trying to increase or maintain, and then deliver the reinforcement accordingly. For example, if there is a particularly challenging behavior that you are trying to increase (ex: potty training), you should pick an item that is very motivating to your child, and only give them access to that item when they engage in the desired behavior (i.e. using the potty). The item should be unavailable at all other times. Examples of reinforcers that can be used at home include: praise and attention, treats, access to preferred electronics, being allowed to stay up later than usual, buying a desired toy, etc. When a behavior occurs that you want to eliminate or decrease, you should use punishment. Punishment is a necessary strategy to use when decreasing undesirable behaviors. Punishment doesn’t need to be something bad or something that your child fears. It is simply a consequence to a specific behavior. As with reinforcement, you need to determine what is going to be an effective punishment for your child. If you child isn’t really motivated by electronics, then taking away electronics privileges probably won’t change their behavior. Conversely, if your child dislikes doing chores, then giving extra chores should decrease the behavior. Examples of punishments that can be used at home include: time out, loss of privileges or preferred items, going to bed early, extra chores, etc. Always be mindful of how much you are using punishment, and to make sure you are also using reinforcement in addition to punishment. When children do not receive any reinforcement, they may start misbehaving more frequently in order to gain adult attention. It can be easy to focus on the negative behaviors and forget to reinforce the positive behaviors that you see. Just as you need to make sure you are not solely punishing behaviors, it is also equally as bad to make sure you are not solely reinforcing behaviors and avoiding punishment altogether. If your child is engaging in specific behaviors that you want to stop, punishment needs to be used. It is important to remember that you are not punishing your child, rather you are punishing a specific behavior or set of behaviors. As your child gets older, the items used for reinforcement and punishment should also change. Both the reinforcers and punishers used should always be age appropriate. Finally, when delivering either reinforcement or punishment, make sure you are delivering the consequence as soon as possible after the behavior occurred, so that your child knows exactly which behavior is being reinforced or punished. For more specific definitions and examples of both reinforcement and punishment, you can reference my last blog: How to properly use reinforcement and punishment. A common difference between children with autism and typically-developing children is their motivation for social feedback and other natural consequences that occur for learning to take place. Typically, developing children have an easier time learning because they are motivated by social feedback from their parents and teachers. But with a child with autism, it is not always as simple as saying “great job!” to encourage learning. Without motivation, it can be very difficult to gain the attention of an autistic child, and even more difficult for learning to take place. So, how do you motivate a child diagnosed with autism? Reinforcers Can Help Motivate Children! Reinforcers motivate children to learn new skills. Often times, children with autism are not readily motivated by social feedback or other natural consequences received from parents, teachers or peers. Insensitivity to social consequences and signals is a core aspect of the disorder. Your child may have difficulties getting out the door for a number of reasons. For example, transitions from one activity to the next may be a problem. Other children may engage in problematic behaviors to avoid a non-preferred activity, acquire access to a preferred activity, or escape transitioning from a preferred activity to a non-preferred activity. The following are some strategies that may help in getting your toddler out the door. However, identifying the reasons for difficulty is important in making a treatment decision and should not be overlooked. • Provide advance notice of an upcoming change in tasks (i.e. a two-minute warning). This could help in reducing “anxiety” related to transitions. • Use visual schedules to communicate transitions between activities to decrease problem behavior. 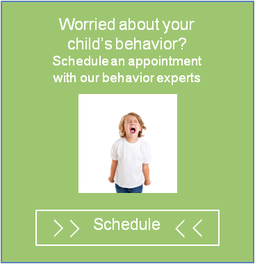 • Deliver positive reinforcement if your toddler follows the schedule or completes the transition without any problem behaviors. Some examples of reinforcers (i.e. what increases the occurrence of a behavior) may be praise, food items, breaks and activities. Every child is different, so their reinforcers may be different as well. Figure out what your child prefers and use this to your advantage in increasing compliance with their and transitions.